Last year I spent my birthday at a hospital either cheering Chris on while he drank down yucky barium or waiting for him to come out of more tests. The icing on the cake of that day was sitting in the oncologist's office listening to him pass on Chris's death sentence. I received the gift of death last year. It was not awesome. As this year's birthday grew closer, people started asking me or mentioning having big celebration plans for my birthday. I would cringe every time at the thought of celebrating, what now seemed to me, death penalty day. This year I really wanted to petition to move my birthdate. I could move it to or near the date I was actually supposed to have been born, the end of March or possibly even April 1st. Chad called this pyrite. Maybe I was meant to be a fool's gold baby. Or maybe my birthdate could be the actual day my parents were finally able to take me home from the hospital (I spent a few months there, it's just what they do when you're like 3 lbs.). But then I became aware of the legal repercussions of changing your birthdate. It's more complicated than changing your name. When it became clear that I could not change my actual birthdate, I started looking into ways to fall off the face of the planet. Disappearing to Paris was an extremely appealing idea. I've never been to Paris and I hear it's lovely. Or maybe I'd like to escape the cold of winter by losing myself on a sunny beach in the tropics. But falling off the face of the planet is EXPENSIVE. I soon realized that I needed look closer to home for my "escape". So I signed up for a weekend Ayruvedic workshop being held at one of the local yoga studios. Yesterday I spent the whole afternoon doing yoga and learning how to build an Ayruvedic kitchen (that's an entry all unto itself). I woke up this morning with a groaning and creaking body that wasn't used to three yours of yoga. My ribs hate me. I am officially 109. I started a new journal. This journal will not contain grocery lists like my current everyday journal. 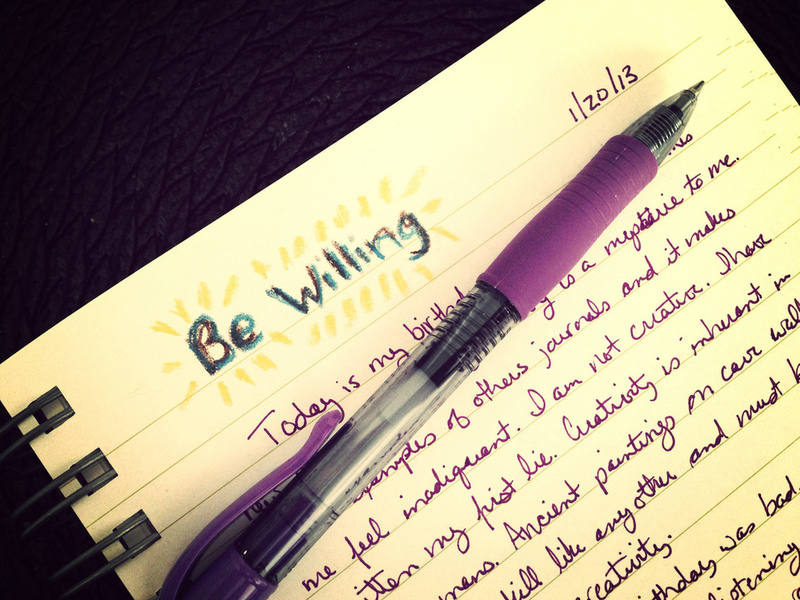 This journal will be just for practicing creativity. This afternoon will be more learning about foods for my dosha and more yoga (ouch). And then I will eat a giant (not good for my dosha) birthday dinner at Cafe Grateful. And I will slowly erase the memory of last year's birthday from my brain.